It is not often associated with cuisine; however, on this particular evening, MC and I decided to get some Korean BBQ into our bellies. We firstly conferred with our expert Korean Nick AKA Bruce Beiber, for his recommendations on the best Korean food in the city, which happened to be BBQ City. Simple. When walking to the restaurant, all the brightly lit signs of the vast amounts of Asian restaurants were a signal that we were in for a treat – somehow I equate fluoro signage with authenticity. 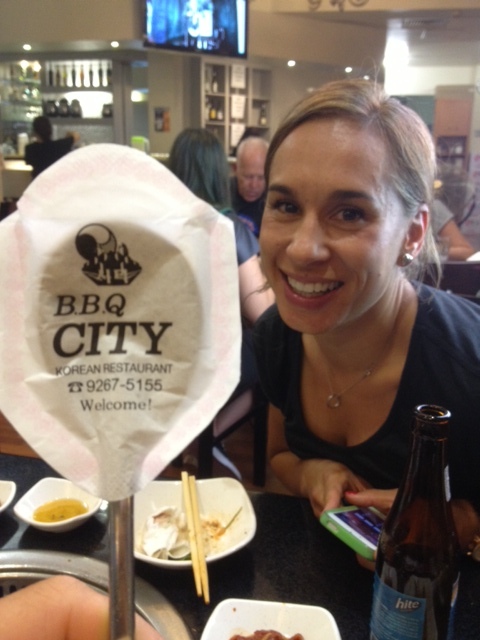 When we saw the BBQ City entrance there were lots of Korean groups hanging around outside – again a sure sign that the food inside was going to be great. Now before you start thinking that I am being racist in my assumption, I learnt this advice from my first ever boss. His name was Ming (actually there were 2 bosses – Ming and Sing – no joke), and I worked in his Chinese takeaway store (for the record it was THE first ever Chinese take-away in my home town back in the day!). Over the years as Asian food grew in popularity he would say ‘the best Asian places are the ones with the Asians eating in it – so if you see that – eat there’. This piece of advice has always done me good. 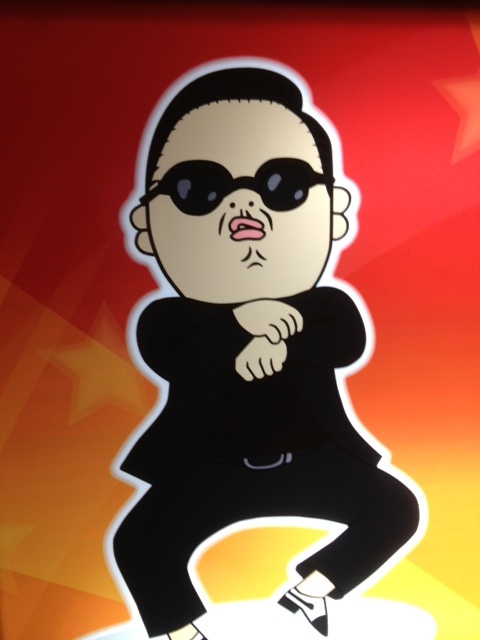 So, in we walk, up the wide staircase, with pictures of PSY on the walls and the sound of K-Pop coming out of the TVs. It is a huge venue, with tons of patrons BBQing and slurping their way through the large amounts of food on their tables. It is a brightly lit, loud and bustling joint, and certainly not the kind of place to visit if you are after a romantic evening. 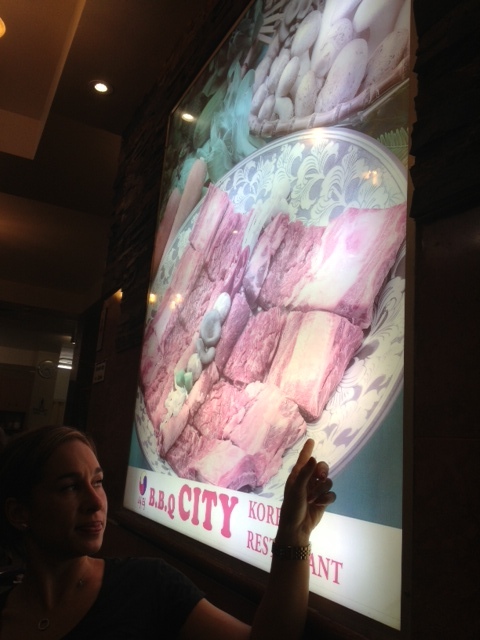 The menu is big, and written in Korean, but thankfully there are pictures of each dish. 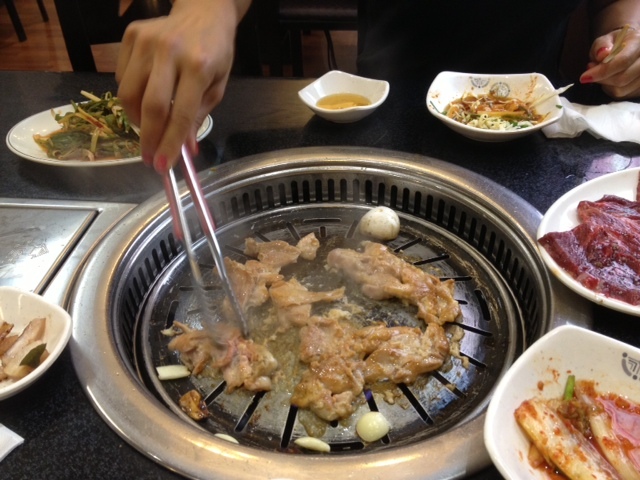 We settled on 3 different meats for the BBQ – a beef, chicken and pork. At a Korean restaurant you will often get loads of side dishes for free – things such as Kimchi, garlic shoots, bean paste, lettuce, oils and other bits and pieces. The idea is to wrap or dip your meat into these dishes to mix up the flavours. These dishes contain lots of garlic, chilli and fermented cabbage, which are great for the digestion. Whilst it may be a little unnerving to eat dishes that don’t look or smell the ‘norm’, exploring these options will do your taste buds and body good. One of the best parts about the BBQ is that you have to do the cooking yourself, and at first, working out how to cook the meat may be a tad confusing. In the end we had to ask the (non-English speaking) waitress how to do it. If you are rookies like us be aware that the marinades from the meat give off A LOT of smoke, and if not careful, you can end up being ‘that table’ where the smoke is billowing like a steam train (yep we were even told to wait for the waitress before cooking our next lot of meat so we didn’t smoke out the restaurant… oops). The whole night was really enjoyable and scored high on my novelty factor. The different food, different environment, and the different culture created a unique but super fun dining experience. Let me start with my ego well and truly front and centre. We did not smoke the place out- I’m Meat Mike Campbell, I mean come on, would I do that..? And secondly, I know my way around a BBQ, don’t you let NN fool you. These, however, are hot plates inside the table, and given my, ah, non-Korean experience with BBQing, it was somewhat tricky to tell if that was the actual hot plate. Alas, it was. Also please not that the changing of said plate was due to a build up of marinade on the plate- standard fare- so a change is required, and the norm. Right, so I have to admit that I do love eating out with NN (oh please…), but having the Korean Mr Beiber along for dinner would have been a highlight. However, it wasn’t to be, so we went about our ordering best, finally getting a waiter that could nail down out order. It’s probably reasonably obvious by now that I like meat, right, so this place has either win or lose on it. Bad meat- I’m gone. Good meat- I’m in. However, in the end it wasn’t the meat that made BBQ City for me, it was the extras, especially the fermented vegetables. 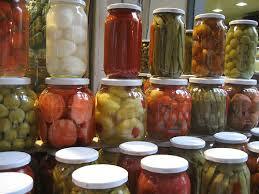 You see, fermentation is a long standing practice which not only naturally prolongs the life of foods, but makes those foods infinitely better for you. What happens here is that fermented foods such as sauerkraut, kimchi, kefir, fermented coconut flesh and other vegetables act to stimulate the digestive system and in doing so ensure healthy gut function. This is not only vital for the healthy break down and absorption of your food, allowing the nutrients to do their thing, but it is paramount for a healthy immune system. Yeah, what? Well, a large majority of your immune system receptors are in your gut, so if you have a poor functioning gut, you are susceptible to a poor immune system and everything that comes with it. On the flip side, a healthy gut promotes a strong immune system- the benefits of which are too many to list here. Suffice to say it’s heaps. The lesson here- fermented foods are your secret weapon in aiding gut health and strengthening your immune system, which both impact directly on any goal you have- be it burning fat, increasing muscle, or simply busting out some consistent training. 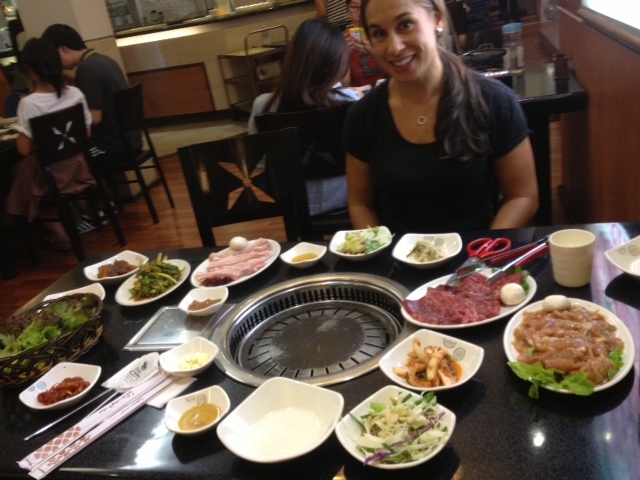 Overall the experience at the Korean BBQ was fun, a novelty and tasty nutritious food. However, the bright lights are too much. Given the cooking at the table thing requires some more light that your average dimly lit eatery, but my retinas were in need of rest! So as tempting as it was to go and bust out some Gangnam Style upstairs, we left to the clatter of Sydney’s Chinatown on a busy Saturday night. Korean food- jam packed full of awesome fermented food- a real bonus to any meal. Go get some. Next week, in fact the next 2-3 weeks we’ll be coming to you from the Great Nation that is New Zealand. There will be some little boomers in store, so stay tuned and make sure if you like this, please share with your friends/fellow food and health geeks and spread the love. Until then, eat your way to a better body- one bowl of kimchi at a time.